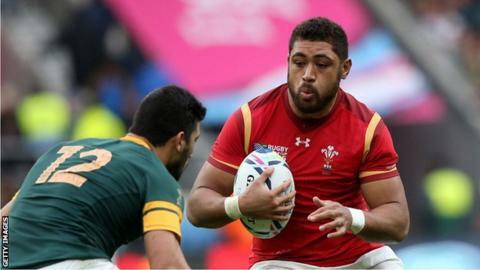 Taulupe Faletau made his 52nd appearance for Wales against South Africa in the 2015 World Cup. Taulupe Faletau's performances may dip as a result of the decision to prevent him from joining Bath, says former Dragons and Wales lock Ian Gough. Wales coach Warren Gatland vetoed a request by the Dragons for permission to sell the 24-year-old international number eight to the English club. Faletau, whose contract ends at the end of this season, will now see out his time at Rodney Parade. "Will it make Taulupe bitter? He might hold a grudge about that," said Gough. "It's very odd. If his heart's not in it and he has put in a request to leave then are you going to get the full potential out of the player? "A lot of clubs I've been involved with have let the person go because they wanted to leave." Under the funding agreement for Welsh domestic rugby, called the Rugby Services Agreement (RSA), Gatland has to sanction international players moving outside Wales. Gatland tried to head-off a potential move out of Wales by Faletau by offering him a national dual contract. However, the offer was withdrawn in May this year when the 52-times capped forward missed a deadline to sign the deal. A statement issued by the Dragons on Tuesday said it was "disappointing on this occasion that we have not been able to act independently in the best interests of the region, or to receive the required support in achieving our preferred outcome". In a WRU statement, chief executive Martyn Phillips said: "Although there are circumstances under which moves out of Wales by experienced players can be sanctioned, Taulupe's status as a player and importance as a role model means we would like him to be playing his rugby here." Another former Wales forward, Emyr Lewis, believes Faletau's commitment will not be affected. "I hope not because he's going to be a free agent next year and if he does that his value is going to decrease and it's the last thing Taulupe Faletau wants," said the former Scarlets and Cardiff number eight. "It's in his interest to go out and give 100% now in his final year and his value should increase. Hopefully he can come to another arrangement with a region and hopefully this time sign a dual contract with Wales."